She never gets what she really wants, but of course, she doesn't always know what she wants. And she doesn't like to be told she doesn't know. She's an elderly calico - and a curmudgeon by any other name would be as contrary...Mostly, it's "let me sleep" or "feed me!" But get a piece of yarn nearby, and it's "PLAYTIME!" C'mon Mom, let me play with the yarn! I'm working on a perfectly lovely scarf in Sesamo, mohair, and Dazzlelash - shades of navy, taupe, and olive (with gold from the Dazzlelash!). I've finished one in Sabrina with fushia and gold Dazzlelash. The first knitted on size 17 needles, garter stitch. The second on 15 needles, garter stitch as well. I take these easy scarves with me to knit when I need not to think. So no pattern is good in this case - I can meditate on whatever is getting ready to happen - a doctor's appointment, medical test, or other long stretch of "wait time." The fushia scarf has already garnered compliments, the navy is still on the needles! I expect it to be finished this weekend, though, because we're expecting 4-8 inches of snow...I'll be staying home and knitting and sewing. My beloved sister was so sweet to gift me with cash for Christmas and my LYS was having an after Christmas sale! So I found these gorgeous yarns I usually would not buy for myself and here are the fruit of that endeavor! Thank you Big Sis!!! Months of health crises, hours upon hours in doctors' offices. Somewhere in the fray of working, waiting, working, worrying, I found 2 friends I thought I'd lost a long time ago: sewing and knitting. Dealing with serious health issues, I bent my head over the sewing machine, turning out close to a hundred fifty totes for sale (mostly) specialty orders. The time over the sewing machine helped me sort through my shock, my fears, helped me keep my sanity as they questioned, poked and prodded. But the time in the waiting rooms...I couldn't take the machine there. 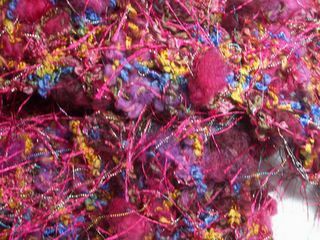 At a craft show in September, selling my totes, my SIL eyed a red fun fur scarf. She'd driven me 5 hours to this show and sold her heart out. It seemed a small amount to offer her. She was tickled. At the next craft show, more fun fur scarves...and someone willing to talk - just cast on and knit, knit, knit. I knew I could do that. So everyone got scarves for Christmas, even the nurses in the doctors' offices! I even sold a few at craft shows along the way. And now, another health scare, connected to the first, caused by the treatment for the first. Still to sew, but more and more, to knit. The healing shawl, made in the midnight blues/teals of Lion Brand Homespun's Colonial, saves me from thinking, just K3, P3, K3, P3. And try to complete three rows in each session (or some multiple thereof). Not for me the Christian trinity. But Maiden, Mother, Crone, the three phases of Womanhood, the phases of the moon. Trying hard to come full-circle as I enter the dark side of the moon, now that I have 2 grandsons, my mother gone, her mother, too (the one taught me knitting and sewing, the other embroidery). Circling through Maiden, Mother, Crone. This shawl is to heal myself, will not be given away, but the next one, already decided, the recipient is a contemporary of my mother's, and living with the same loss as I. A beautiful Lion Homespun in Blue Ridge, the colors of the mountains where we live. I will tell her what the colors are like, burn them into my own memory for future moments when I need to remember that there are others more needful than myself. 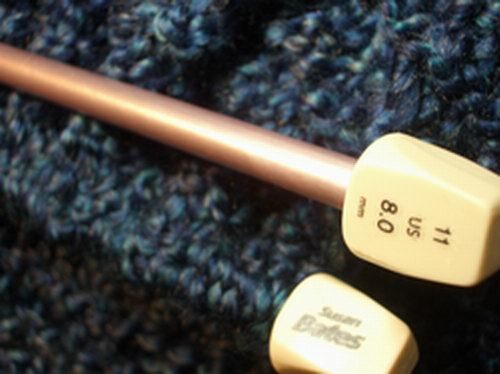 While I can still see, I'll knit.